This is a proper grown-up dessert and ideal for a dinner party or special occasion meal as it can be prepared in advance. In fact, the crème caramel is very much the better for being allowed to sit for 12 hours or more. You might think that since the main ingredient here is coconut milk it would have a coconut flavour, but the coffee and caramel pleasantly neutralise it. The biscotti are a little extra effort, but they are a simple biscuit to make and keep for ages. Even better, both elements of dessert are vegan. Recipe from Mildred’s Vegan by Daniel Acevedo & Sarah Wasserman (published by Mitchell Beazley, £25). Place 6 metal dariole moulds or ramekins on a heatproof mat or chopping board ready to use. Put the sugar in a saucepan and add the measured water – just enough to make all the sugar wet. Bring to the boil, without stirring, and simmer until the sugar starts to catch, that is when dark caramel spots begin to appear. This takes 5–10 minutes but don’t be tempted to leave the room because you might come back to a pan full of smoking black tar. Once the dark caramel spots begin to appear, give the pan a quick swirl and then continue to cook until it reaches an even orange brown (caramel) colour. Quickly coat the base of each dariole mould or ramekin with about 2 tablespoons of the caramel. This is where you need to work fast, as the caramel will continue cooking. Next make the espresso crème. Place all the ingredients into a saucepan, adding just enough espresso to achieve a café latte colour and flavour, and bring to a simmer. Simmer gently for about 10–15 minutes, whisking frequently with a balloon whisk, until all the agar has dissolved. Remove from the heat and strain through a fine-mesh sieve. Pour the espresso crème into the moulds and refrigerate for 12–24 hours until ready to serve. To turn the crème caramels out, hold each mould with your hand over the top and give the caramel a small firm shake from side to side. It should loosen inside the mould. Place a plate on top and turn both the mould and plate over together. 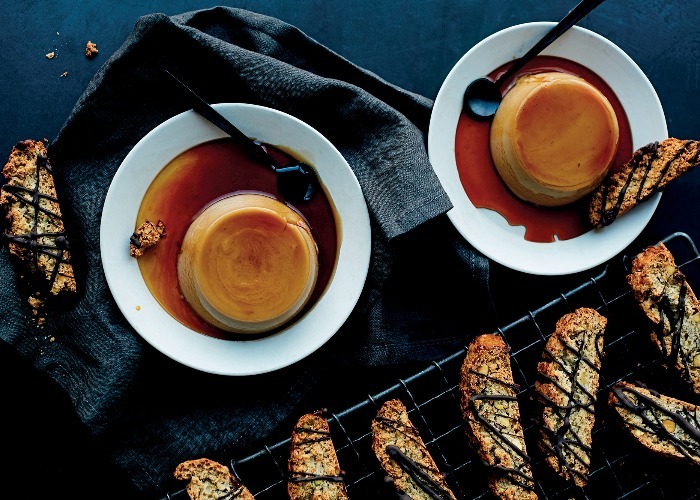 The crème caramel should come away when you lift the mould. Preheat the oven to 190°C/375°F/gas mark 5. Line a large baking sheet with baking parchment. Mix the cornflour with the orange juice to make a smooth paste and set aside. Measure out the flour, baking powder, salt and ground pistachios into a bowl, add the orange zest and mix together. Beat the sugar with the almond milk, melted coconut oil and vanilla extract in a stand mixer fitted with the paddle attachment, or with a hand-held electric mixer in a bowl, until frothy. Add the cornflour paste and whisk for a further 3 minutes or so. Fold in the flour mixture until a dough forms. Divide the dough into 2 flattened loaves about 7.5cm (3 inches) wide and about 2.5cm (1 inch) thick. Transfer to the lined baking tray, then brush with a little vegan cream and sprinkle with demerara sugar. Bake for 35 minutes. Remove from the oven and leave to cool for about 10 minutes. Using a sharp bread or serrated knife, cut each loaf on a slight diagonal into slices about 1cm (½ inch) thick. (Don’t worry if you lose a few in the cutting process.) Lay the slices carefully on the lined baking sheet and bake for a further 20 minutes, flipping over halfway through. Remove from the oven and leave to cool, then drizzle with the melted chocolate, if you like. Recipe from Mildred’s Vegan by Daniel Acevedo & Sarah Wasserman (published by Mitchell Beazley, £25). Photography by Matt Russell.